Link up to Flaunt YOUR Finish at the bottom of this post. Please grab a button from the side bar to share on your blog! While it's already the second day of November, this Flaunt Your Finish if for October's completed projects. We have some BEAUTIFUL finishes, this month, and while I shouldn't say I'm saving the best for last...But seriously, I'm saving the best for last. Agnes finally finished her monster of a quilt. It's somewhere around 90 by 100 inches - the biggest she's ever done to date! Agnes says she would have NEVER managed to quilt it, if it weren't for the 18 wheeler of a longarm machine at The Stitching Post. She also tried a new quilting pattern: "flat stippling" (she thinks that's what it is called), which, along with the "pebbles" around the band in the middle, is supposed to give the quilt a zen-like vibe. 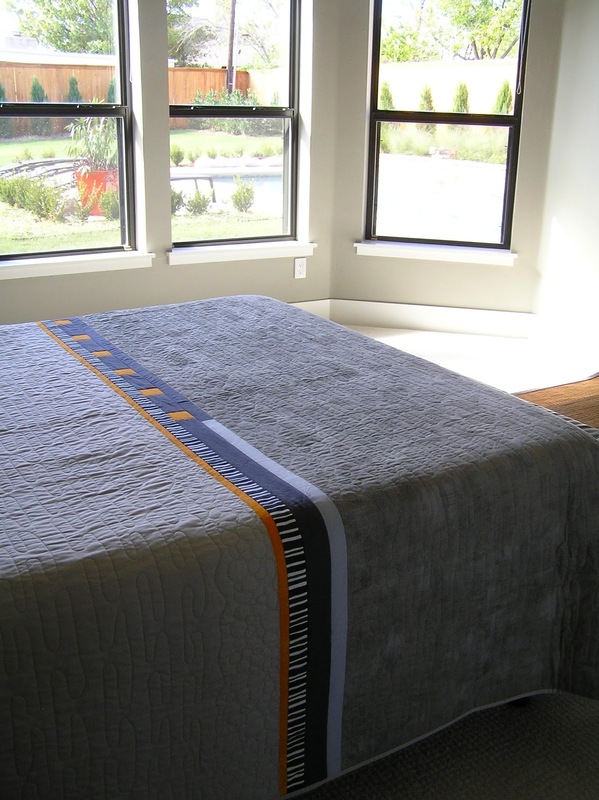 "Believe me", says Agnes, "It is not easy to come up with a pattern for THAT MUCH negative space!" 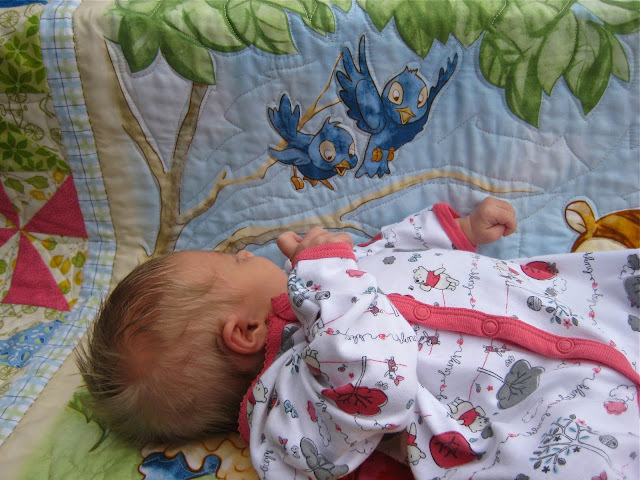 The small toss pillow was a kind of afterthought, but I agree with Agnes in thinking it compliments the quilt nicely. 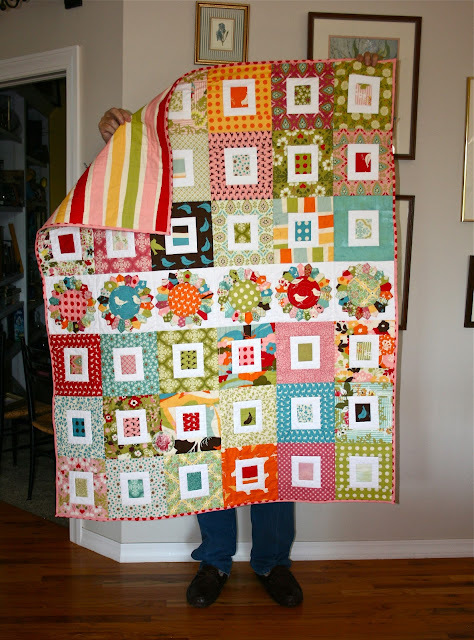 This next adorable quilt is by Mandy and she's called it her Sugar Dish quilt. 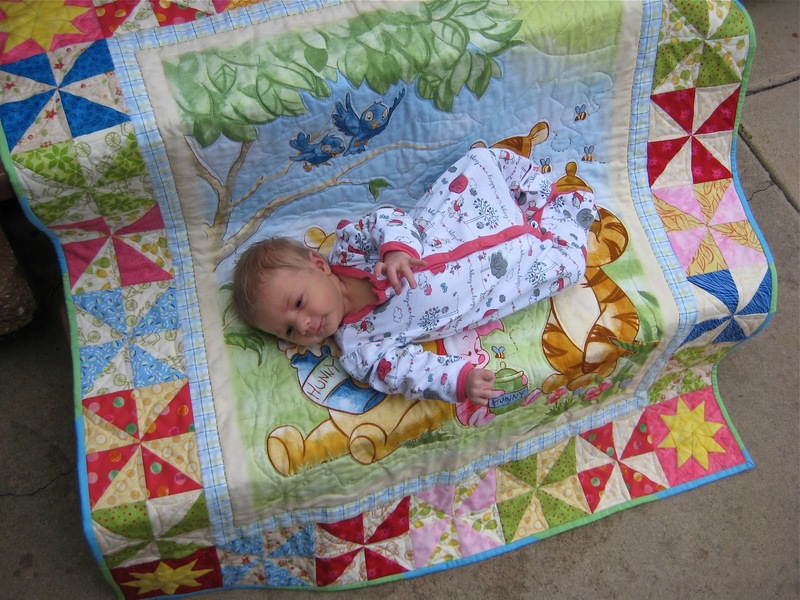 In our last Guild Meeting Wrap-Up we posted a photo of Mandy with this quilt's look-alike. 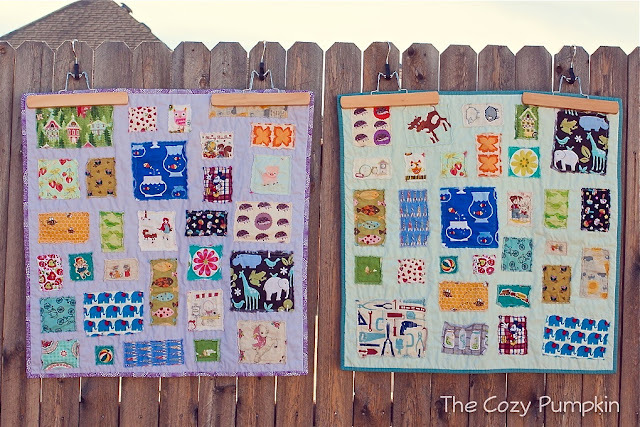 Two Cute Quilts = Two Lucky Kids! Amanda and her family went on a trip to Disney World, and she was the smart mommy to who made these two "I Spy" quilts. She went for a fast and easy Ticker Tape method, and made each quilt in each child's favorite color. In the end...Amanda says that no one played "I Spy" with their quilts at any point of the trip, but her son did sleep with his on the plane to and from (so like his Daddy) and at the hotel. Her daughter...well, she still isn't convinced there is anything very fun about the quilt other than it's purple. Oh two year olds! In our last WIP Wednesday, Erin showed us this quilt in progress that she made with her class at school. 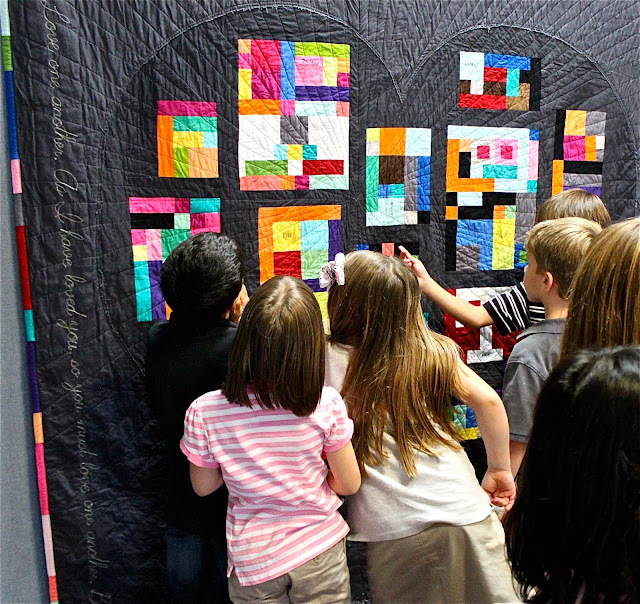 Every child designed a "mini quilt" out of fabric to be featured on the front of the quilt, and they signed their name on their block. They did such a great job and as they gather around to look at the quilt, you can just tell that they were excited to be a part of it! Robin had a BIG Finish that none of us can compete with. Little Autumn O was born October 11, 2012. 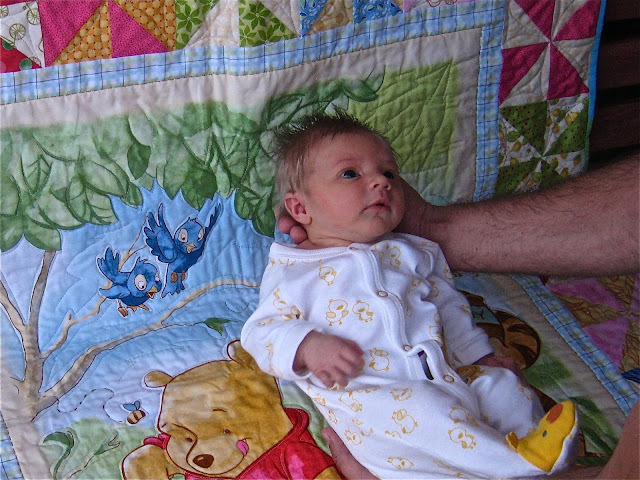 After 9 months of gestation, Robin put the final binding stitches on her Pooh quilt when the contractions were *literally* 10 minutes apart. Oh my goodness...look at that hair! I can't take how cute she is! As Robin was in a hurry....the pinwheels were done using this tutorial from Missouri Quilt Company and the stars in the corner are a scaled down version of the Evening Star from the Summer Sampler Series. All the fabrics were a mishmash of FQs from the local quilt shops and her stash. Stay tuned for projects like high chair covers and baby clothes in the future, but first she has to start sleeping again. Now that you've seen our finishes, we'd love to see yours! 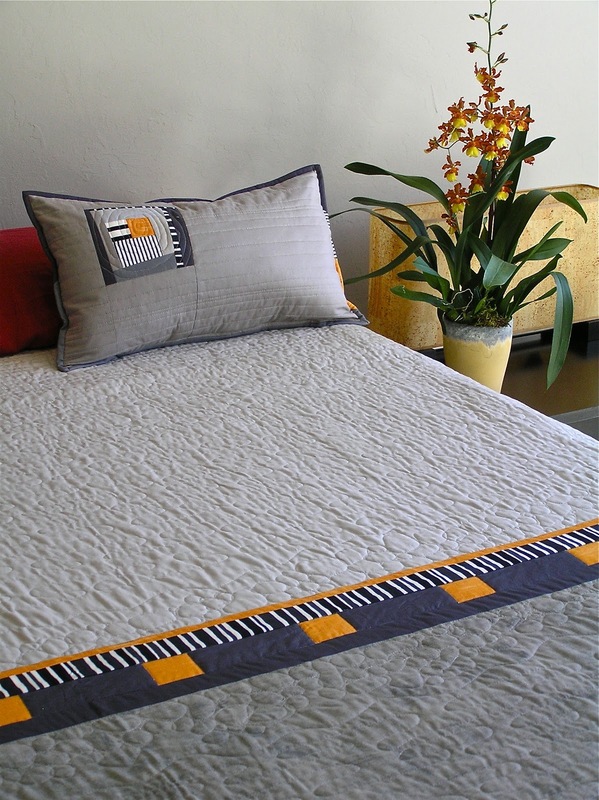 1) Your quilt must be actually finished. 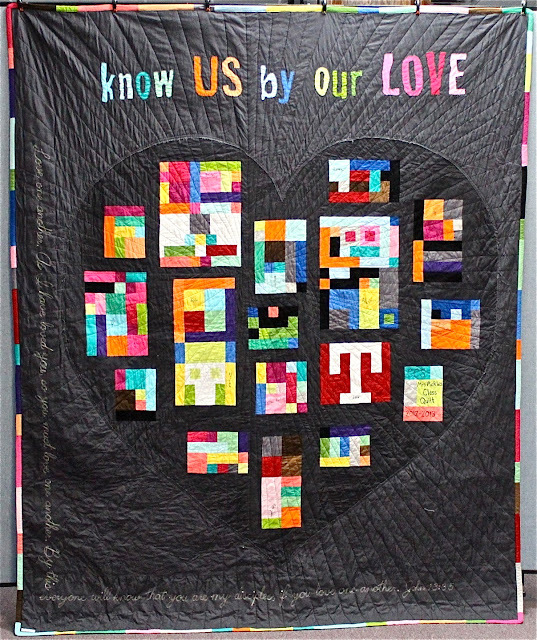 2) Your linked quilts need to have been completed in the month of October.